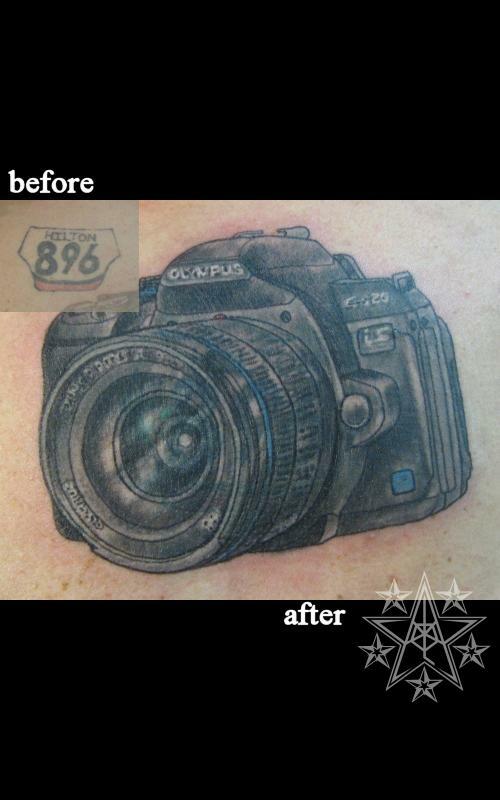 In Focus Color cover up tattoo using a camera. Mum's the Word Color freehand cover up tattoo using a chrysanthemum. 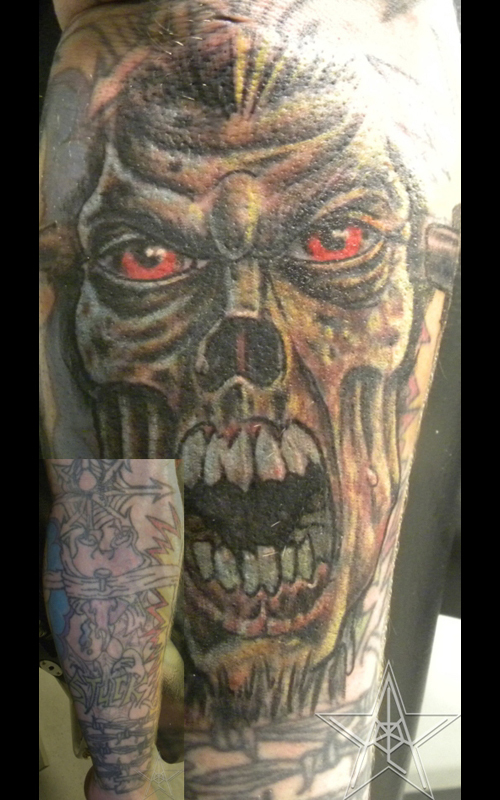 Zombify Color freehand cover up tattoo using a zombie. Succubus Cover Color freehand cover up tattoo using a screaming succubus. 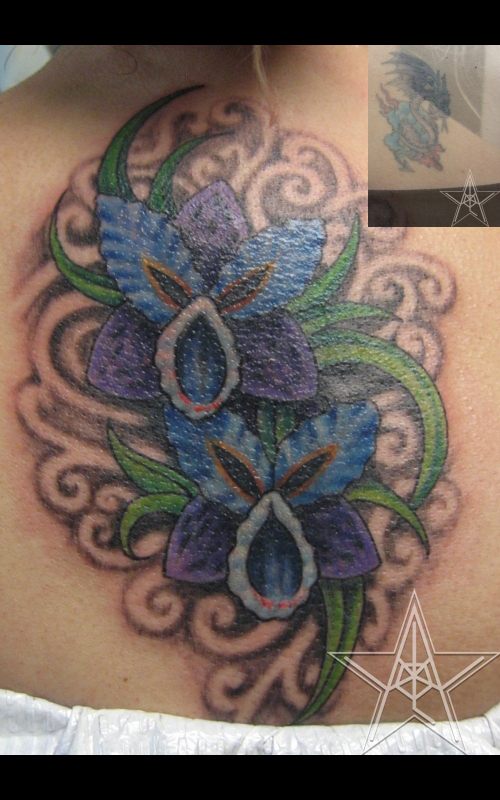 Growing Tranquility Color freehand cover up tattoo using orchids. 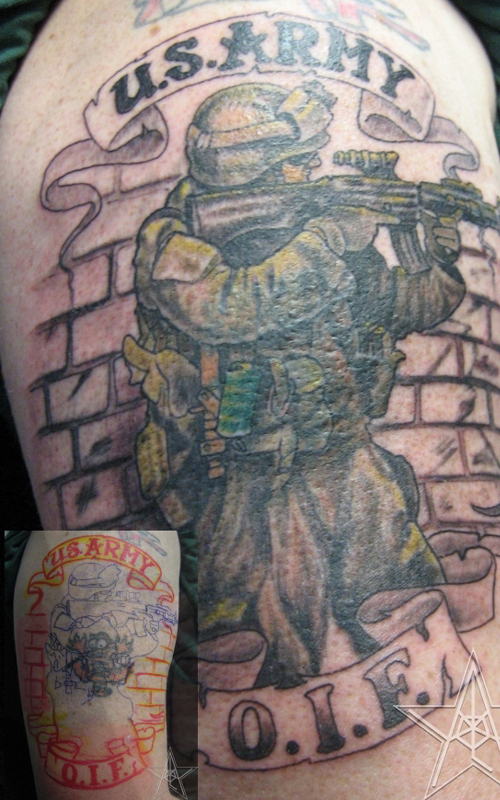 OIF Cover Color cover up tattoo using a U.S. soldier. 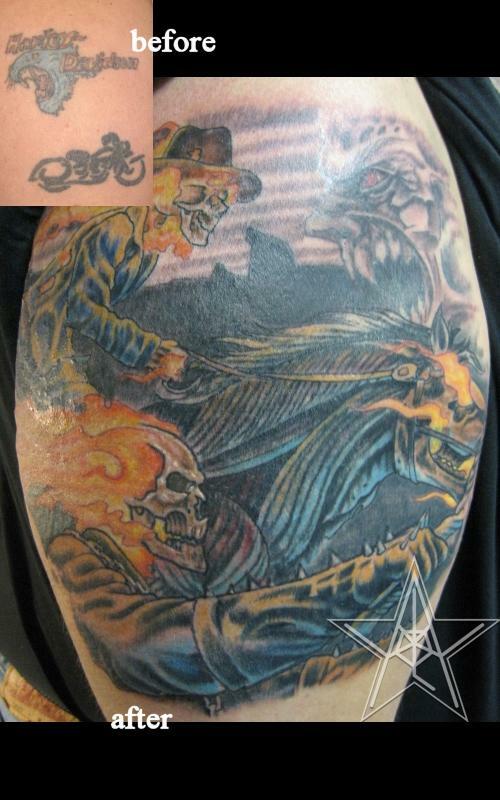 Dual Riders Color cover up tattoo using the Ghost Riders. 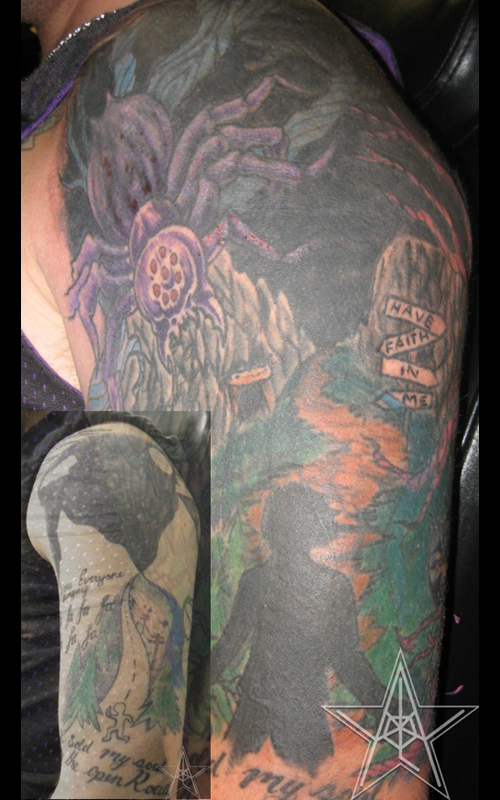 Dangerous Path Color cover up tattoo using an album cover for reference. 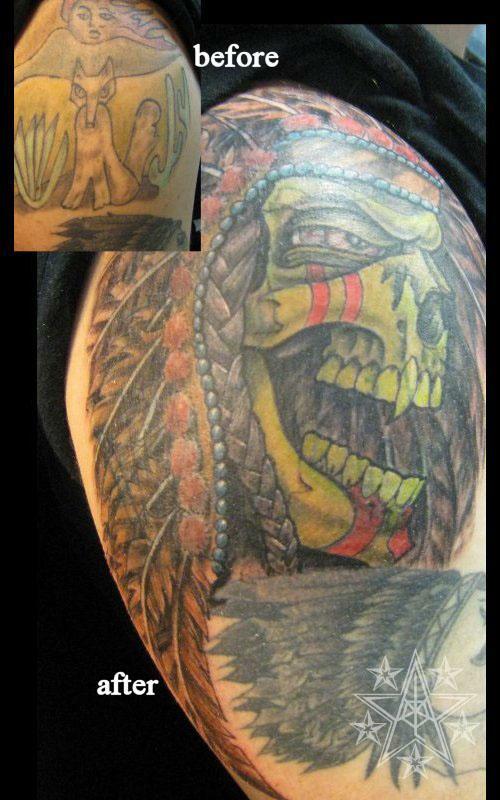 Bringing the Chief Color freehand cover up tattoo using a Native American. 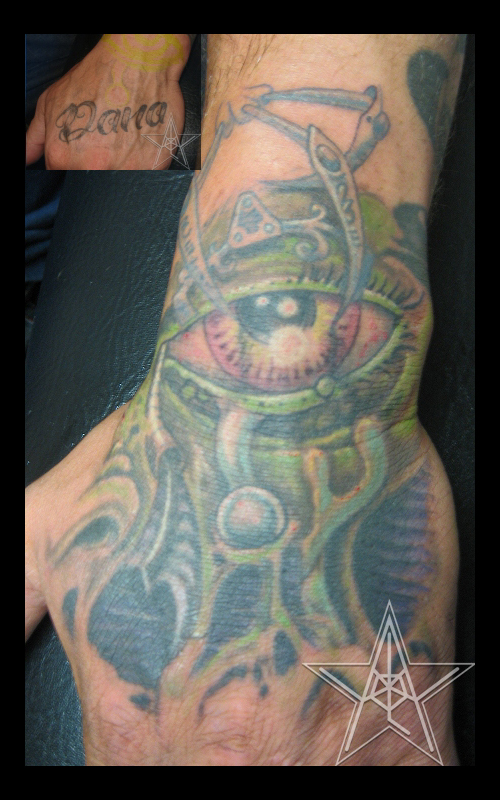 Bye Bye Dana Color freehand cover up tattoo using biomechanical. 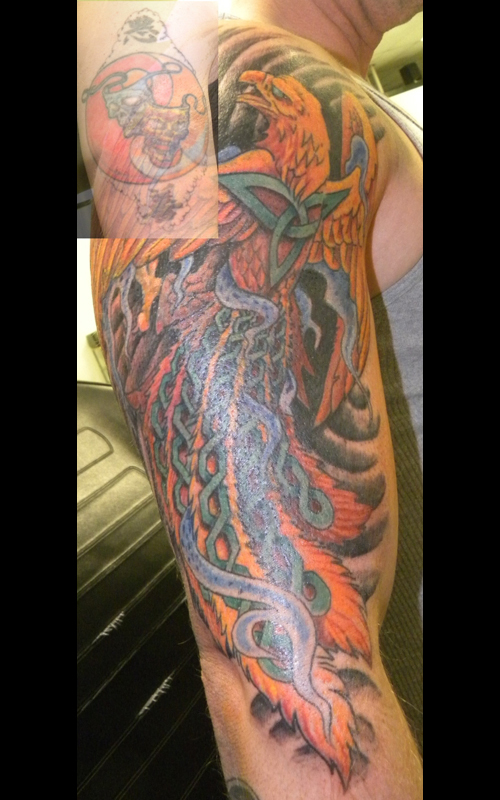 Yin to Phoenix Color freehand cover up tattoo using Celtic knotted Phoenix. 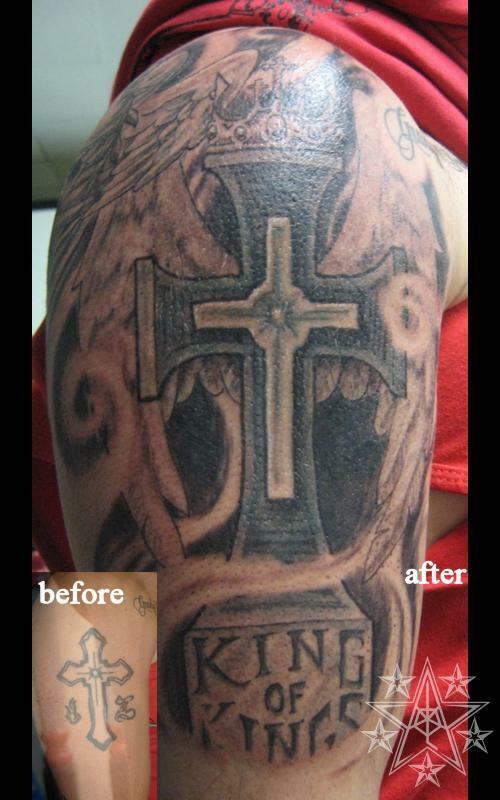 King of Kings Cross Black and true grey freehand cover up tattoo using a cross. 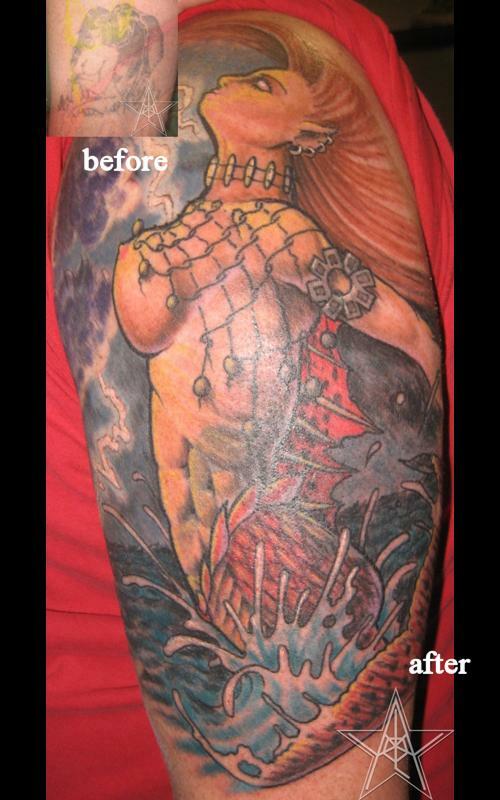 Upgrade Color freehand cover up tattoo using a mermaid. Samurai Cover Color freehand cover up tattoo using Samurai mask. 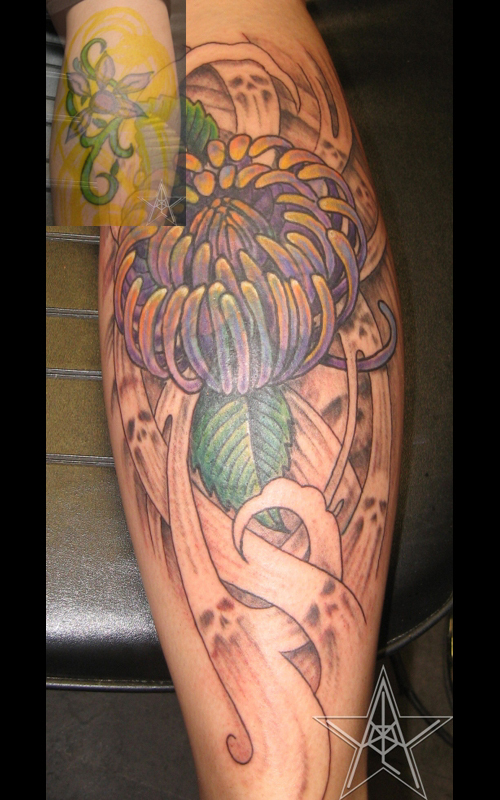 Better Growth Color freehand cover up tattoo using a chrysanthemum. 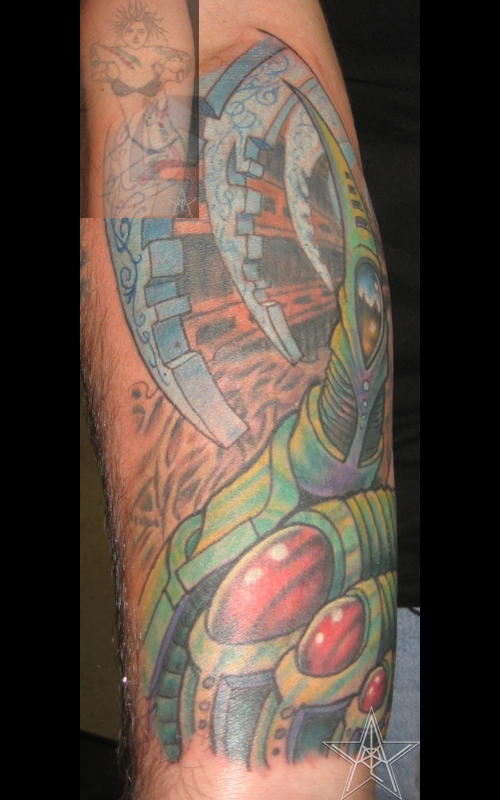 Goodbye to Punker Girl Color freehand cover up tattoo using biomechanical. 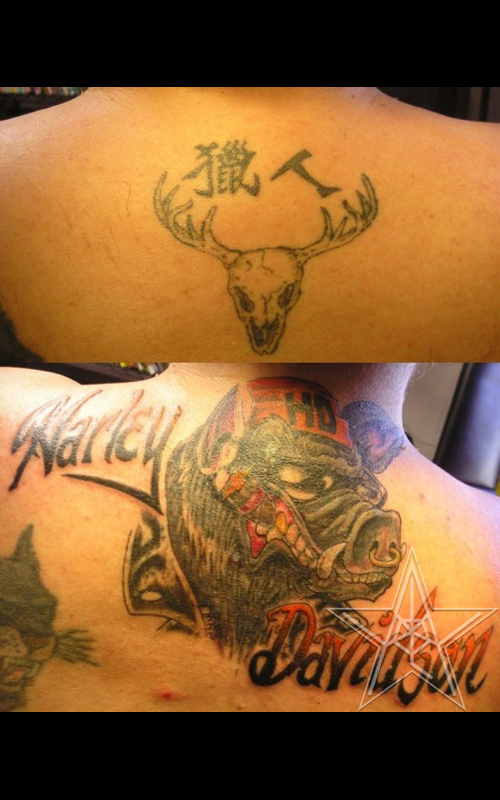 Harley Hog Color cover up tattoo using a Harley Davidson Shirt. 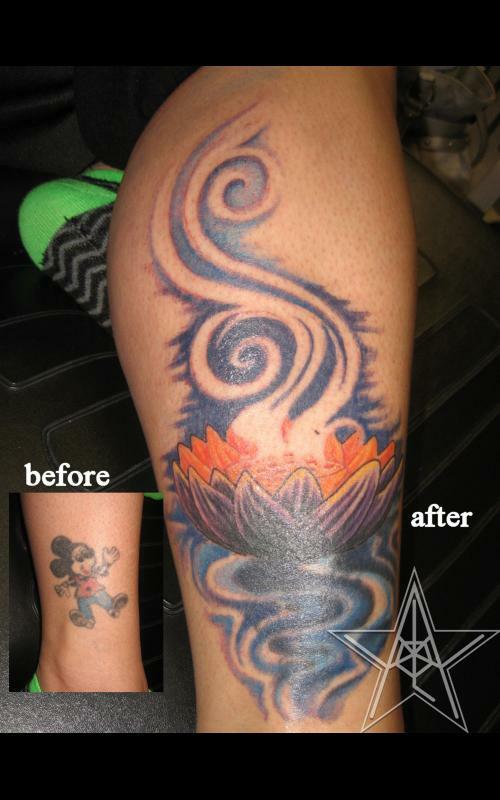 Essence of Life Color freehand cover up tattoo using a lotus. Gerbers 'n' Filigree Color freehand cover up tattoo using Gerber daisies. 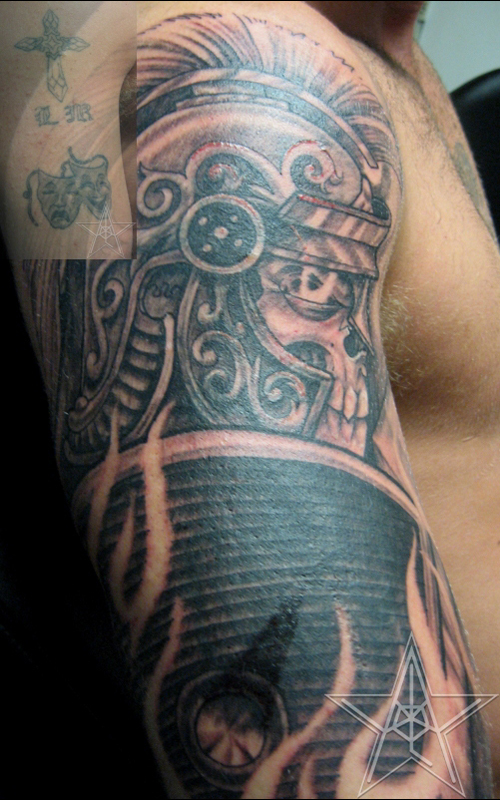 Warrior past Death Black and grey freehand cover up tattoo using a Roman style skeleton warrior. 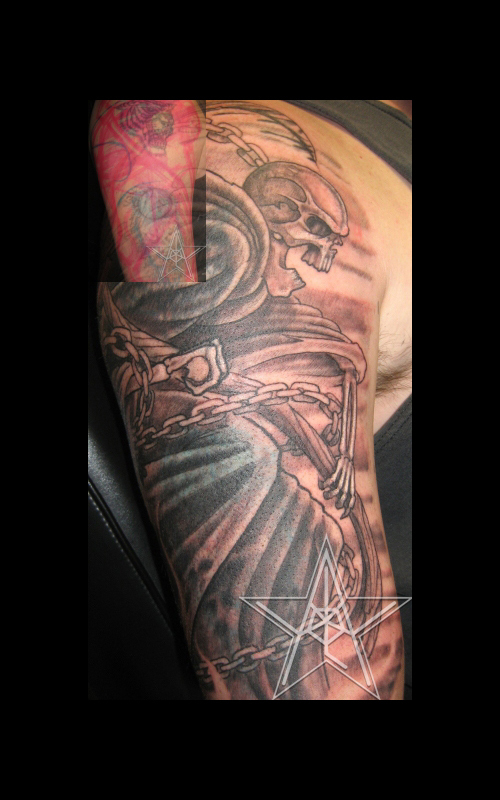 Death's Greeting Black and grey freehand cover up tattoo using the Grim Reaper. 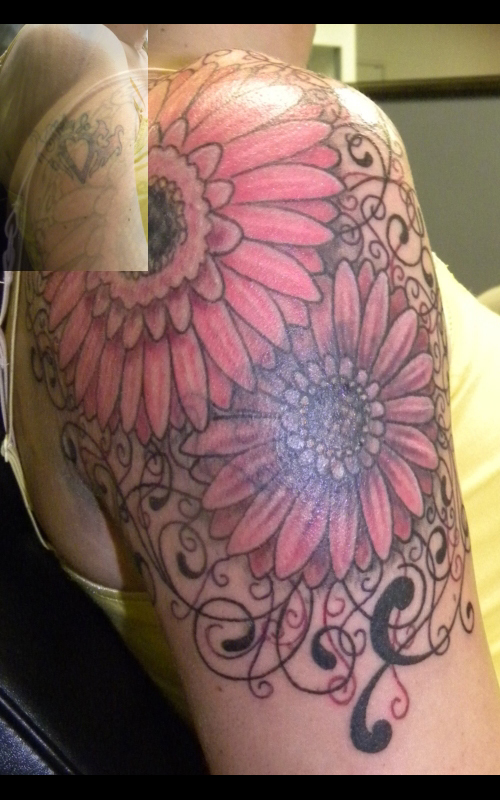 Bounce, Bounce, Gone Color freehand cover up tattoo using flowers. 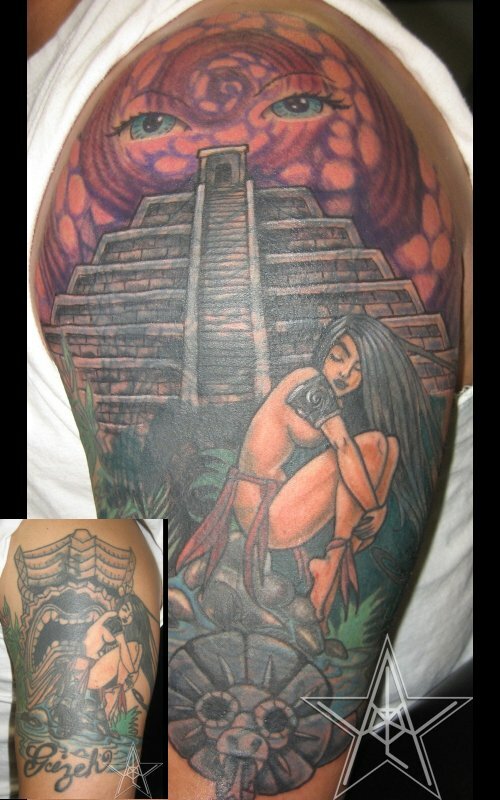 Goodbye Tiki After Color freehand cover up tattoo using a Mayan temple and Quetzalcoatl. 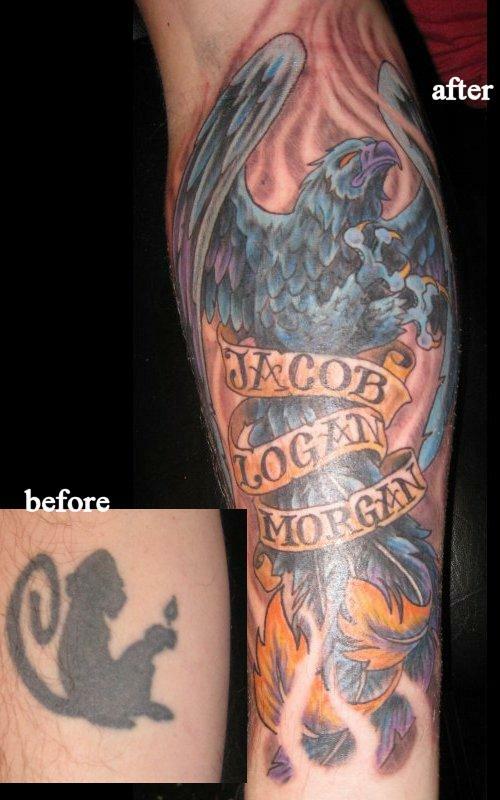 Battered Monkey Panther Black and grey freehand cover up tattoo using a cross and tribal. 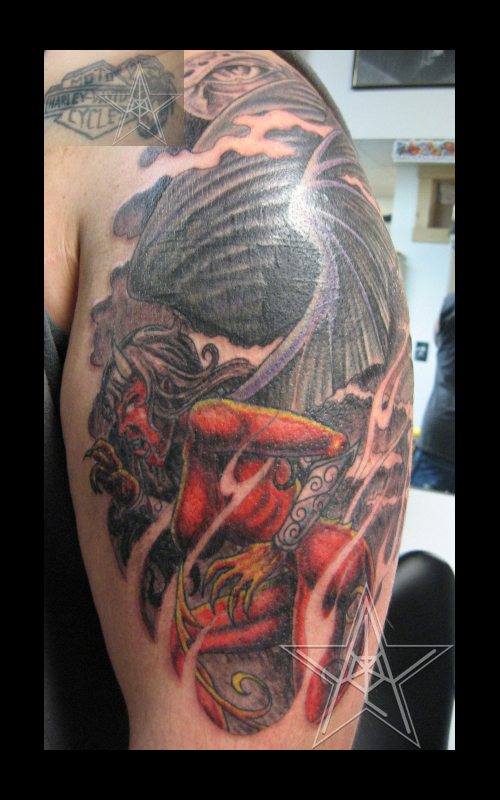 Goodbye to the Monkey Phoenix cover up tattoo. 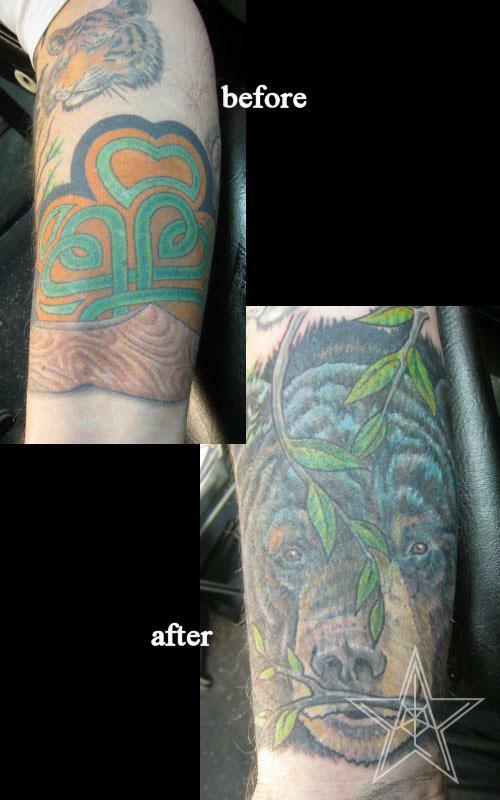 Natural Course Realistic Bear cover up tattoo. 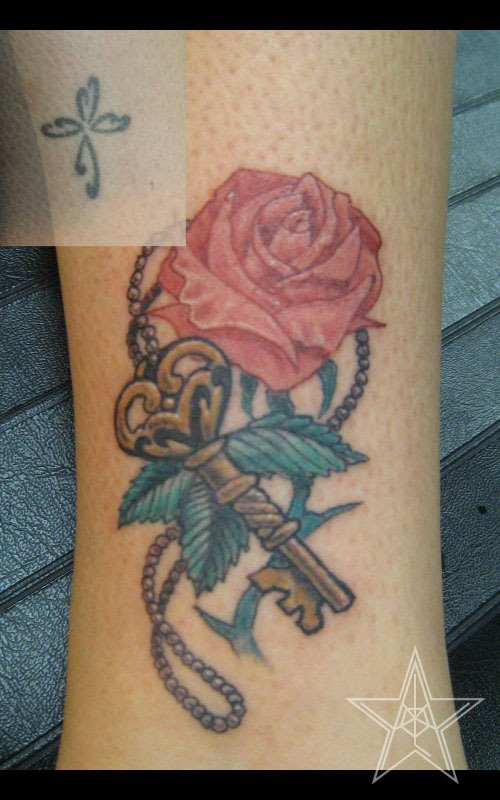 Rosenkey Colored rose and key coverup tattoo. 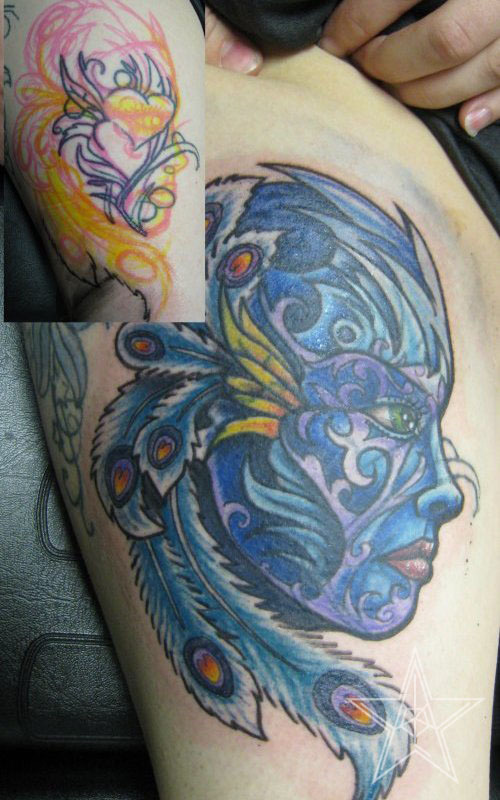 Just the beginning Fantasy woman's face coverup tattoo. Sparrows replaced with Koi Japanese fish tattoo used to cover sparrows up. 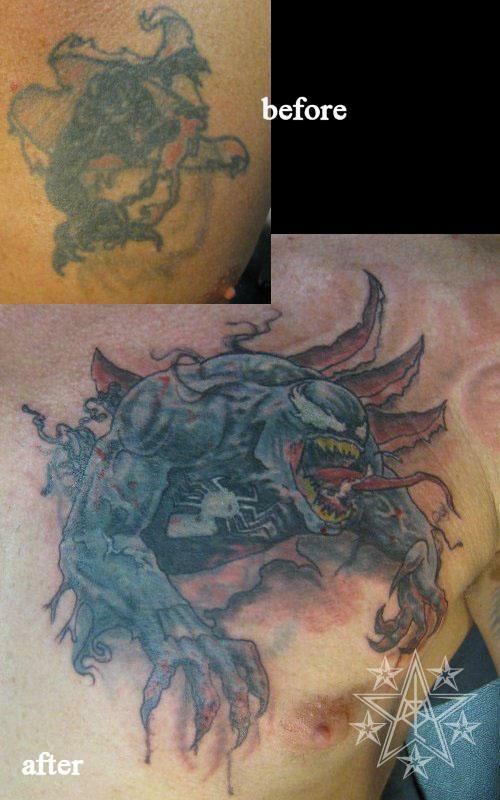 Venom Revamped Old venom tattoo cover up. 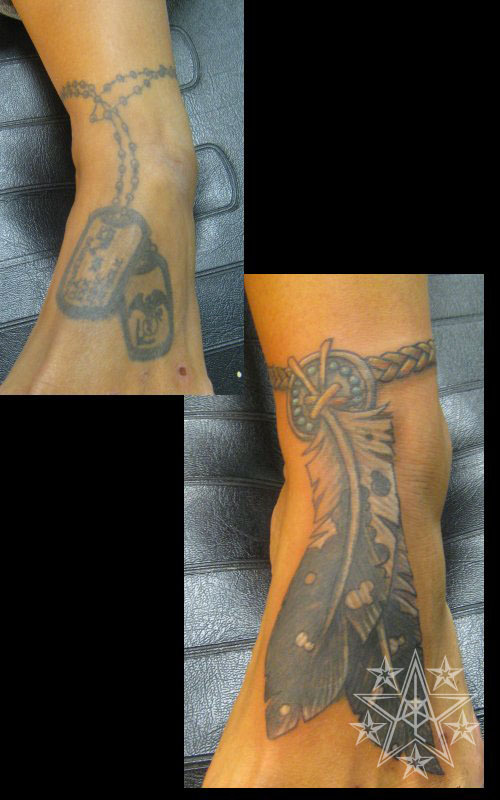 Native Fox Eliminated Indian skull cover up tattoo. 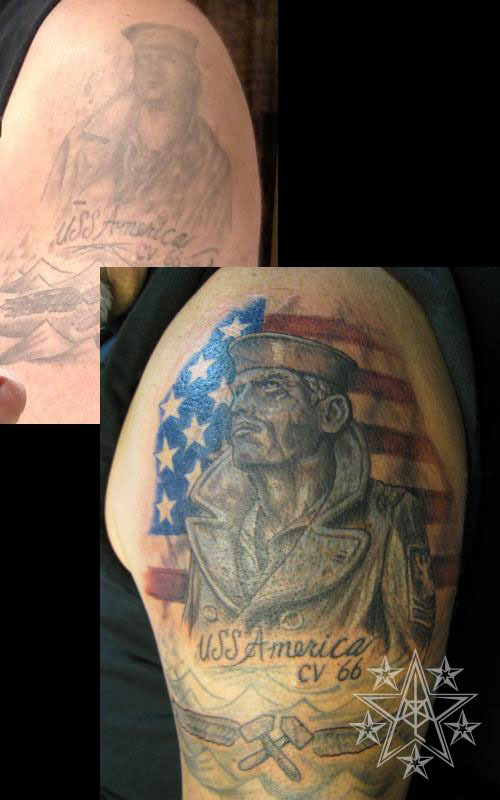 The Lone Sailor Coverup of poorly done Lone Sailor tattoo. 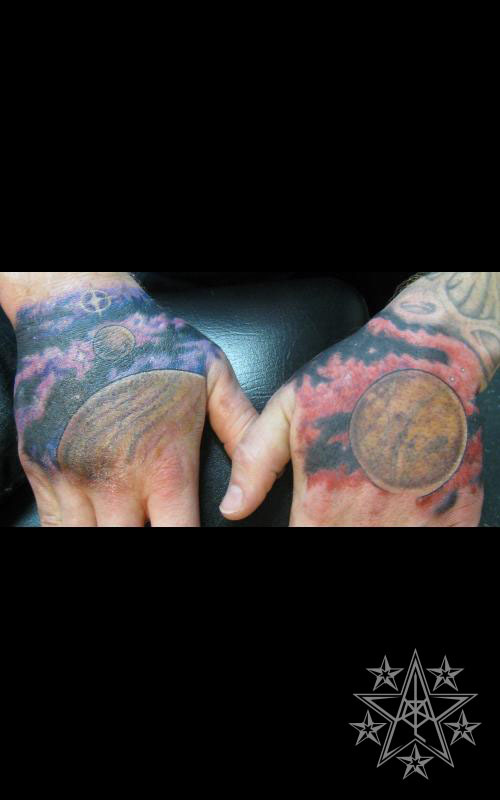 No Before....again Planets covering lettering hand tattoos. Goodbye Iguana Jester used to cover iguana tattoo. 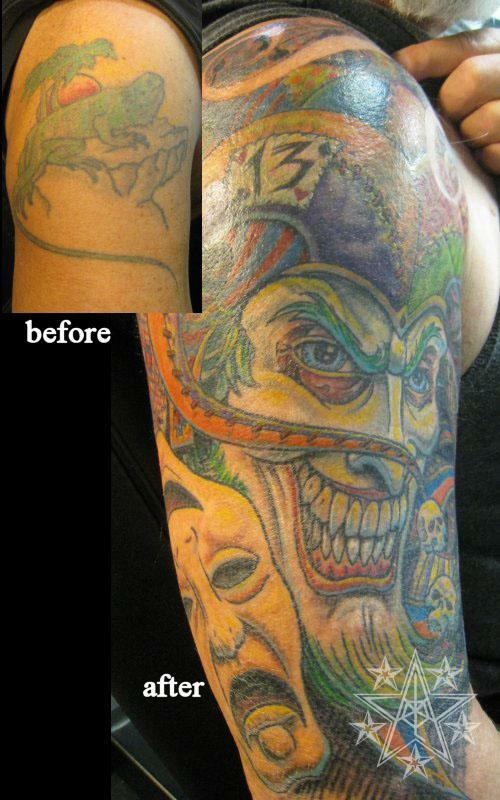 Cover up tattoos by Ray Reasoner Jr.
Cover Up: The elimination of one or more tattoos by skillfully placing another tattoo over them. This is far more complicated than it sounds and few people excel in this area. 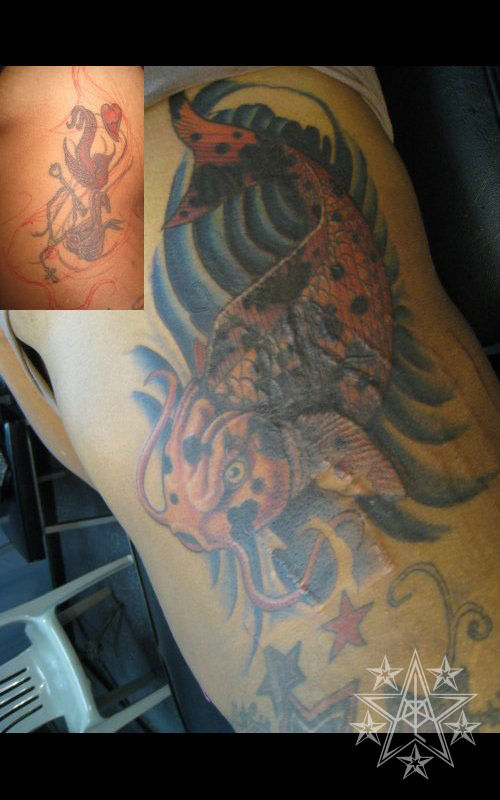 It is not uncommon for many tattooists to refuse to do them since they are quite a bit of work or because they simply don't have the skill set to deal with them.